and news about GRC in general will appear here. 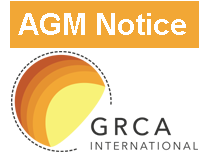 The GRCA AGM will be immediately proceeded by a GRCA Technical Working Group meeting and immediately followed by a GRCA Council meeting. All GRCA Members are invited to attend. 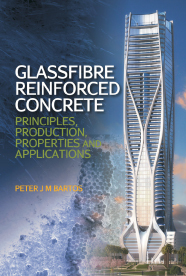 The International Glassfibre Reinforced Concrete Association (GRCA) has recently introduced two new techNOTES to the GRC technical series. techNOTE 9 Quality Matters and techNOTE 10 Appearance Matters. 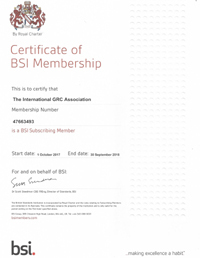 The International Glassfibre Reinforced Concrete Association (GRCA) is pleased to announce that it is now a Member of the British Standards Institute (BSI). The GRCA is committed to raising Glassfibre Reinforced Concrete (GRC) standards worldwide, and BSI Membership will help it do this more effectively and with greater efficiency. The Association also has representation on various British and European Standards Committees. This International Glassfibre Reinforced Concrete Association (GRCA) web site is secure and using an SSL Certificate. Look out for a small padlock symbol in the address bar (or elsewhere in your browser window) and a web address beginning with https:// (the s stands for 'secure') to ensure that you are on the correct, secure GRCA web site. 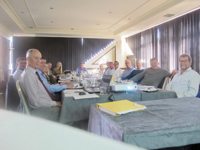 The GRCA Council Meeting was immediately proceeded by a GRCA Technical Working Group meeting. State of the art review of GRC for all users and specifiers. Glassfibre reinforced concrete (GRC) is the most complex material widely used in current construction practice. It is an unusual composite, in which both the matrix and the reinforcement themselves are composites. This new book sponsored by the GRCA, provides guidance on the properties, its specification, testing and the latest methods for efficient production. The International Glassfibre Reinforced Concrete Association (GRCA) has updated the GRC fire testing reports, including the classification of reaction to fire performance of GRC in accordance with EN 13501-1. All GRCA Members were invited to attend. The GRCA have renamed the higher grade of membership for GRC manufacturers to "Full Member". Any manufacturer displaying the “Full Member" logo, previously referred to as the Approved Manufacturer Scheme” (AMS), has been audited by an independent certifying body appointed by The International GRC Association. As part of the Full Member audit process the GRC manufacturer must demonstrate that they have sufficient resources in plant, equipment and labour to design and manufacture high quality GRC in accordance with the Full Member regulations. All email and telephone numbers remain the same. The GRCA AGM was immediately followed by a GRCA Council meeting.